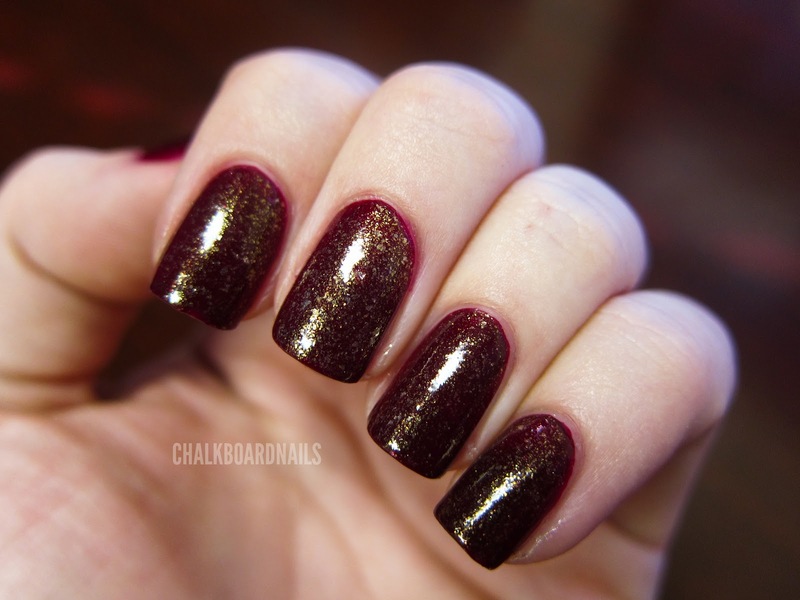 I purchased China Glaze Velvet Bow from their Let It Snow collection for this year. It is gorgeous on its own, and I wish I had taken pictures of it alone. It is this really beautiful deep red, and it is the consistency of a jelly, so when you are in the sun the color really lights up. When you are in the shade, it becomes this vibrant, rich dark red. So I did that first as a base, and then I added one coat of Essie As Gold As It Gets, which is from their recent Luxeffects collection (in drugstores now). It is a clear base with tiny gold flakies in it. I love flakies, but I guess I prefer them larger. These flakies were a bit too small for me and it wasn't as dramatic as I was hoping it would be. It look very Christmas-y, right? I don't know what it is about this combination that just wasn't working for me. The picture above is a good demonstration of what Velvet Bow looks like in the shade. Very dark and vampalicious. Here's what it looks like with some more lighting on it. See how it becomes brighter and more colorful? And you can almost see down into the layers of jelly? Cool effect, but damn me for putting that Essie on top. 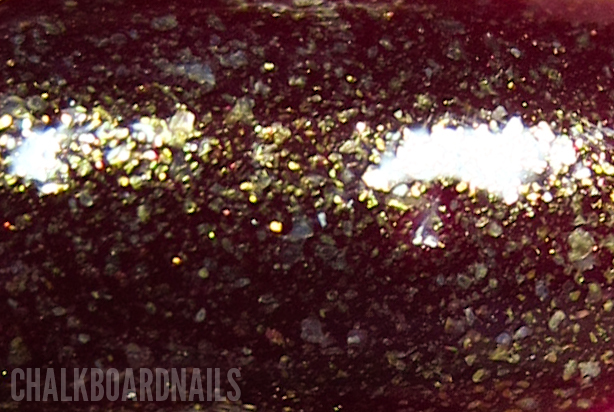 And here is a macro of this manicure. As you can see there are like, MICRO MICRO flakie pieces as well as flakies of larger sizes. Don't get me wrong, the Essie polish is really pretty! I think it was just the color combination that I wasn't feeling here. They were both great separately. I like it! But then again, I'm a little Christmas obsessed. Very pretty!! I really like it. This is so pretty, I love it! I like this combo.. I'm still trying to decide what to wear with my As Gold as it gets...hmmm? I feel similarly about As Gold as It Gets. The bottle makes it look so fun and gold. Then you put it on and it loses the gold and takes on similar colors of Nubar 2010. This IS very Christmas-y, I love it! You almost have a gradient effect with Velvet Bow in some of these photos haha! I'm currently wearing Velvet Bow too. Was thinking of putting something glittery over it but decided to keep it simple in the end. Glad I did! I love the colour combo! I think it looks great - very christmassy! I have both of these-and I really love Velvet Bow-I just need to wear it!! Leopard nail modeling, with special guest! So who wants to see the most epic thing ever? 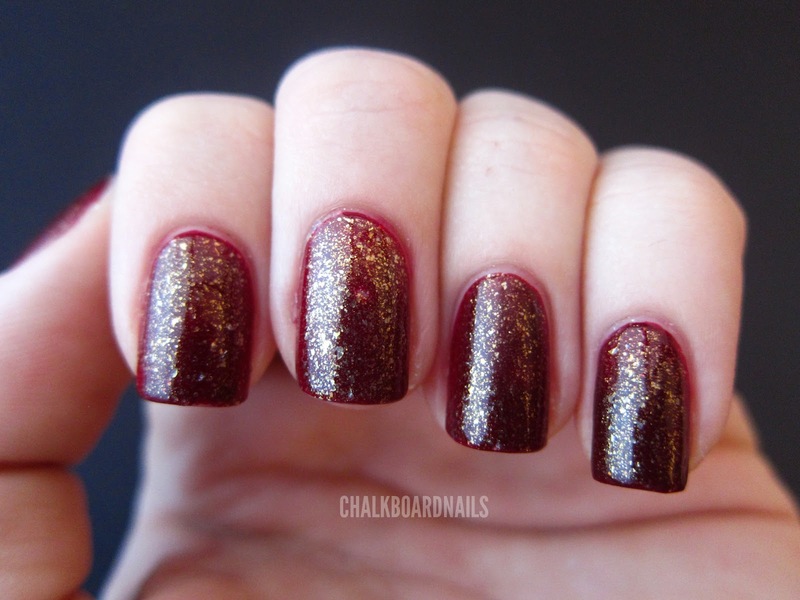 Zoya Renee - Palate Cleanser!